The colors in the cotton knit fabric above are natural. By natural I don't mean that the yarns were dyed with natural dyes. In fact, they weren't dyed at all. What I mean is that the yarn in this fabric is its natural color, the fiber grown in brown or green, and in this case, spun with a natural creamy white yarn to give them their earthy pastel colors. The colors do not fade; they actually become deeper with each washing, reaching their full color richness at around the tenth washing. Although I recall hearing of such magical fibers a while ago, it was only recently that I did the research to learn more about color-grown cotton and then to eventually locate a spinner/supplier who was producing a line of yarns that I could knit. This breeding program began with seeds saved by people in the Southeastern United States that were being kept alive in the USDA cotton seed bank in the late 1970′s. Dr. Angus Hyer, USDA Agronomist, encouraged breeders to consider using them as sources of natural pest and disease resistance due to their vigor. Click to read Karen Brown's fascinating article on Sally Fox and her color-grown cotton odyssey. The cotton yarns I'm working with originate from plants grown in the Southwest US from non-GMO seed, though from a different seed stock than Fox's. As with the natural white yarn I'm using, the growers use biologically-based, integrated pest management practices. The fabric will be machine knitted locally (metropolitan NY area) -- a modest, yet innovative, line of sweater knits consisting of jerseys, a rib stitch pattern, and a multi-color pattern. Matching rib fabrics for bands and bindings will also be available. Will all the fabric I produce from now on originate with fibers that are grown using sustainable cotton growing practices? What about organic sheep raising practices when wool season rolls around again? I can't promise either. But I'm certainly paying close attention to my yarn sources now. And what about the colors? The greens and browns are really amazing, but sometimes, we really need bright purple. 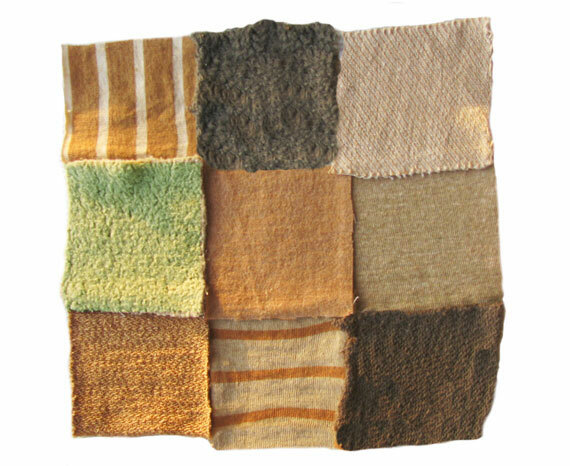 I know that the various types of dye have a range of environmental impact. Both Organic Lifestyle and Dharma Trading have articles on the topic. I'd like to read more. Please do share any reading suggestions you may have in the comments. 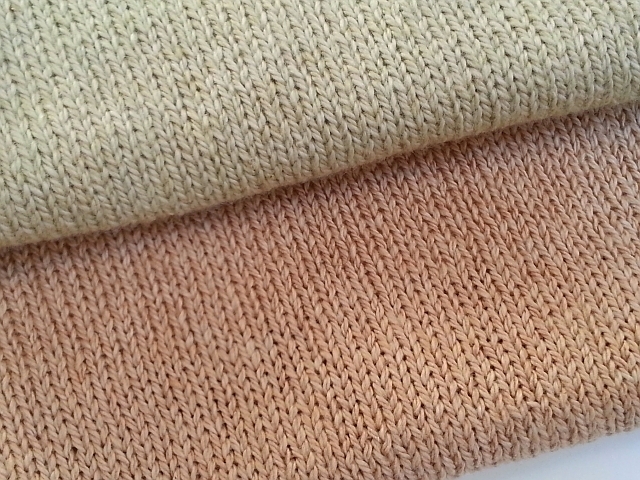 My new cotton knits fabrics will be available this spring are now available in the online shop. If you'd like to be among the first to know when new fabrics are available and receive discounts on future orders, please be sure to subscribe to the newsletter. If you ever want to talk plant dyes - just call me! I have a bathtub full of cotton/linen yarn I am about to plant dye and a sink full of silk yarn to plant dye! I love the cotton btw! and want to look into your source! Yes, we have lots to talk about! See you soon. Love. Never heard of Colour-grown cotton before, but it sounds really great, and they look beautiful. Thanks for sharing.